If you really fancy taking part in a triathlon this summer but are put off by the swim… don’t despair, the fast growing sport of duathlon might be just the thing and can be just as much fun! Duathlon is widely accepted as the little cousin of triathlon but quickly growing in popularity. Once known as the ‘off season’ sport for triathletes, it is now becoming a competitive sport in it’s own right, with our very own British women currently both Elite (Catriona Morrsion) and Age Group (Emma Dews – pictured below centre) world champions. Duathlon eliminates the need for swimming and follows a run/bike/run formula. But don’t be fooled, just because you don’t swim doesn’t make it a walk in the park – it’s tough. An Olympic distance duathlon is a 10km run, 40km bike and a final 5km run – no mean feat, especially when you’re racing flat out. There are, however, many other shorter distances on offer and mountain bike duathlons are springing up all over the UK, offering a great opportunity for a bit of muddy fun! 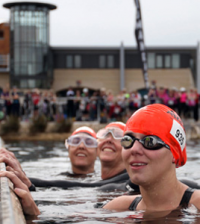 Have a look at www.britishtriathlon.org for race listings and you’re bound to find something to suit – there are a huge variety of distances and events. Most duathlons tend to take place in the spring and autumn months and are also ideal training if you are targeting a summer triathlon. A lot of multi-sport athletes dip in and out of both sports, and use duathlon as a spring-board to summer triathlon success or just for some ‘off-season’ fun. Whilst duathlon is less well known than triathlon, events are springing up all over the place, some with first timers in mind. Events like the London Duathlon (organised by the same team who run the London Triathlon www.thelondonduathlon.co.uk) is perfect for newcomers, takes place in Richmond Park and is traffic free. Other events can be more competitive and attract serious athletes, so pick with care and look for a ‘sprint’ race, which looks beginner friendly and preferably traffic free. Patience and pace judgement are THE most important factors for duathlon success – regardless of the distance. Hit the first run too fast and you’ll suffer for the rest of the race. Take it too easy and you’ll never catch up! Always take the first run at a comfortable pace and reel in your competitors later! Buy, beg or borrow a road worthy bike and get it serviced. Persuade a knowledgeable friend or your local bike shop to set you up correctly, so you’re comfortable and efficient. 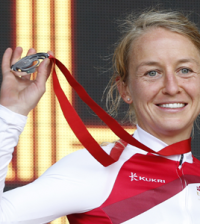 You’ll also need a helmet (compulsory in duathlon events), cycling glasses and running shoes fitted with elastic laces. Don’t spend a fortune though, any bike will do – so long as it’s safe – and many people do their first few duathlons on mountain bikes borrowed from friends. Duathlons tend to present a bit of a quandary when it comes to clothing choice. Avoid fully padded cycling shorts (have you ever tried running in a nappy?) and opt for a specific pair of ‘tri’ shorts which give you a minimal pad for comfort, but allow you to run freely. Depending on the weather, you’ll find that ‘layers’ are key for duathlon comfort – allowing you to add or discard items in transition. You’ll feel hot on the run, but your temperature will drop on the bike. So add a layer or a gilet, along with gloves or arm-warmers for the cycle section, removing them for the final run. Transition from the first run to bike can be tougher than you might think. Your heart-rate will drop once you’re on the bike and it can take a while to get your breathing steady, especially if you’re riding in an aero position. It can take a little while to get into a good rhythm – so set your gears low and pedal with a high cadence. Transition from the bike onto the second run is even worse. Expect to have very tired, jelly legs! You can train for this however, with special ‘brick’ sessions designed to get your legs used to moving from bike to run. Do a 15 minute run immediately after a long bike ride once or twice a week. Or try a gym session, where you do 10 minutes cycling, 10 minutes running and repeat 3-4 times. If your duathlon lasts longer than 60-90 minutes, you need to think about taking on some ‘mid-race’ energy in the form of a sports drink or gel. You’ll use up your stores of carbohydrate quickly in a duathlon – mainly due to the first run – so take a boost with an energy gel after about 20-30 minutes and keep sipping energy drink throughout the bike section. Duathlon is a superb sport for runners looking for a challenge or for something different – and especially for those who don’t want to get wet! Cycling is a perfect activity to combine with running – reducing the risk of ‘overuse’ injuries associated with pounding the pavements. Both sports are easy to fit in to busy lives – no hassling with the gym or getting to the pool – perfect for career girls or hectic mums. 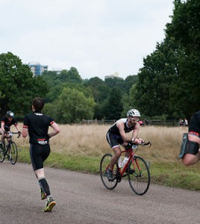 Train for a duathlon and watch your fitness levels soar…. What are you waiting for?